Check out our Youth Stories! The goal of the Pathways to Independence Natural Supports project is to discover, support, and disseminate creative and promising approaches for supporting youth with disabilities to participate more fully and naturally in school, work, and community activities. In 2007–2008 we were able to offer mini‐grant packages comprised of funding, ongoing technical assistance, and practical resources, to increase the capacity of schools and communities to support youth with disabilities in accessing school and community opportunities that lead to the same relationships, work- and volunteer-related experiences, and community opportunities as their peers. Funded by the Wisconsin Medicaid Infrastructure Grant through the Department of Health and Family Services Office of Independence and Employment and implemented through the Waisman Center, this project is designed to draw out the very best ideas and approaches for enhancing the full participation of youth with disabilities. Please use this website and its content to continue to create and provide opportunities for youth in your community. 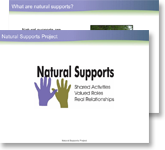 What do we mean by natural supports? Most middle and high schools are full of opportunities for youth to develop supportive relationships with their peers, explore their strengths and interests, learn important life skills, and make valuable connections. Too often, however, participation by youth with disabilities in work experiences, classes, extracurricular clubs, youth groups, and other opportunities that comprise everyday school life is restricted to "special" programs that depend wholly on the presence and support of teachers, paraprofessionals, job coaches, or other paid supports. However, schools and communities increasingly are discovering that it often doesn�t require special services and paid supports to meaningfully include youth with disabilities. Indeed, classmates, peers, co-workers, and other individuals who are already involved in school activities, places of business, and community programs can readily be drawn upon to more naturally support the inclusion of youth with disabilities. Typically, these individuals just need some basic information and a little guidance to effectively support youth with disabilities in existing school classes and activities, jobs, and other community opportunities. Quite often, they simply just need to be asked. Schools and communities throughout Wisconsin already are exploring an array of innovative ideas and strategies to provide natural supports to youth with disabilities. This grant is designed to discover and promote effective, natural ways of providing supports across a variety of different school, work, and community opportunities.